'''Tertön''' ([[Wyl.]] ''gter ston'') — a revealer of spiritual treasures ([[terma]]) hidden by [[Guru Rinpoche]] and [[Yeshe Tsogyal]] for the benefit of future generations. '''Tertön''' (Tib. གཏེར་སྟོན་, Wyl. ''gter ston'') — a revealer of spiritual treasures ([[terma]]) hidden by [[Guru Rinpoche]] and [[Yeshe Tsogyal]] for the benefit of future generations. Starting with the first tertön, [[Sangyé Lama]] (1000–1080) and [[Drapa Ngönshé]] (1012–90), discoverer of the [[Four Medical Tantras]], there have been hundreds of masters who specialized in the discovery of terma, continuing up until the present day with Kyabjé [[Dudjom Rinpoche]] and Kyabjé [[Dilgo Khyentse Rinpoche]]. 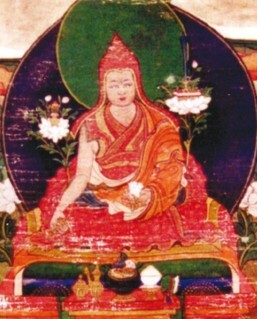 [[Image:Jkwhandscloseup.jpg|thumb|[[Jamyang Khyentse Wangpo]]]]Starting with the first tertön, [[Sangyé Lama]] (1000–1080) and [[Drapa Ngönshé]] (1012–90), discoverer of the [[Four Medical Tantras]], there have been hundreds of masters who specialized in the discovery of terma, continuing up until the present day with Kyabjé [[Dudjom Rinpoche]] and Kyabjé [[Dilgo Khyentse Rinpoche]]. 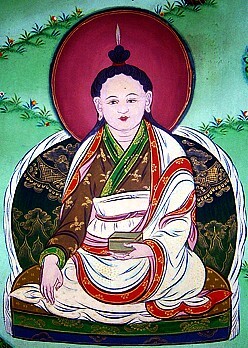 *his disciple and teacher [[Terdak Lingpa]] (1646-1714).